Mr. Lynch leading Danny-Boy. Photo by David Lansing. That Danny-Boy is a clever horse, says Mr. Lynch. We have been stopped in the middle of the road for a good fifteen minutes waiting for Danny to continue on. All our cajoling has been for naught. Even when Mr. Lynch got off the caravan and tried to pull Danny forward with the bridle the horse wouldn’t budge. So Mr. Lynch climbed back atop the caravan and we just sat there, waiting. The thing is we had decided to take a different route back to Ann Gardiner’s farm and Danny didn’t like it. This is not the way you go, he would have said if he were more like Mr. Ed and less like Mr. Danny. I know the way and you don’t and I won’t be going this way. Go on your own if you want, but I won’t be joining you. The spot Danny chose to stop was in front of a country house where two young children were playing in the yard while a couple of dogs ran around yapping and the mudder hung laundry on the line. One of the little ones, a girl about six or seven, came over and leaned against the fence. What’s the matter with your horse? she asked. There’s nothing wrong with him, I said, more than a bit embarrassed. He just doesn’t want to move forward. The little girl turned around and yelled, The man’s horse won’t move, Mummy. The woman put down her basket of laundry and came over to the fence. Her son, who looked a bit younger than the girl, came over as well. Do you want me to help you move him? she asked. I’ll tell you, it’s a very embarrassing thing to be sitting up high on a gypsy caravan with the reins in your hand and a big brute of a beast like Danny-Boy in front of you and you can’t make him move so a woman doing laundry has to interrupt her day to give you a hand. That would be very nice of you, I said. The woman went back to the house and came out holding a couple of carrots. She crossed under the fence and went up to Danny and talked to him in a low voice while stroking his neck. He seemed to quite like it (of course, if she’d climbed up on the gypsy caravan and talked to me in a bedroom voice while stroking my neck I probably would have liked it as well). Then she held out one of the carrots in front of Danny and made a little clicking noise. Danny immediately began to move. She grabbed his bridle and walked up the lane with us a bit, her two children giggling and squealing as they danced alongside the caravan. When we got to the top of the rise she said, Do you think you can handle him now? I think so, I said. Thanks very much. Oh, it’s no bother, said the woman. 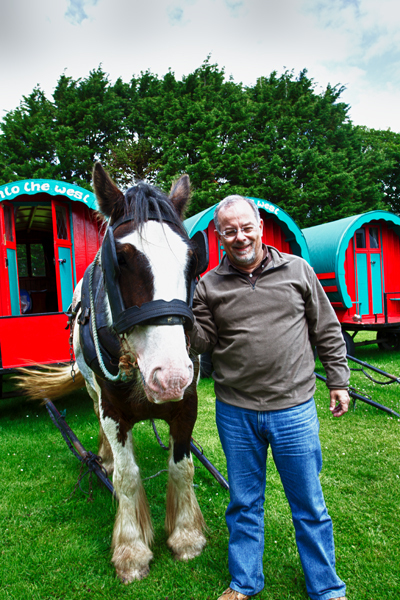 You’re not the first to come by driving a caravan that had no clue how to make a horse do what a horse is supposed to do. I suppose not, I said. She gave us a wave and then, grabbing the hands of her children, ran down the hill back towards the home. Not a minute later, Danny stopped dead in the road again. Fortunately, this time we were out of sight of the woman and her children. Mr. Lynch climbed down with his walking stick. Look here, he said sternly to Danny, holding up the staff. We know you don’t like going this way but we don’t really care. We’re not turning around and going on the other road. So you might as well get used to it. Otherwise it will be a long day for all of us. And with that, Danny started up again. Well done, I said to Mr. Lynch when he climbed back up on the caravan. Well, said Mr. Lynch, quite pleased with himself, sometimes you use the carrot and sometimes you use the stick.